So, how is version 3 going? When we started working on v3 back in April, we had a roadmap of features for Protopage versions 3, 4 and 5. It became clear that in order to allow for the more ambitious features we have planned for future versions, we would have to create some common infrastructure that has significantly extended our v3 timeline. With version 3 we’re going beyond expectations to create some powerful ways for you to organize and categorize your page content. We’re creating the means for you to extend Protopage and add your own functionality – so you’ll be able to customize your Protopage even more than ever before. The look and feel has also had a spring clean. Thank you all for your patience – we hope that you’ll be as excited with version 3 as we are. 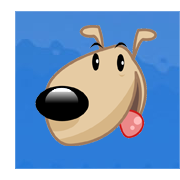 By the way, say hello to Protopuppy, our new mascot! This entry was posted on Friday, August 11th, 2006 at 11:34 pm	and is filed under pre-announcement. You can follow any responses to this entry through the RSS 2.0 feed. Both comments and pings are currently closed. Can you tell us when it is going to be released? I desperately would like to be able to access protected feeds through protopage, feeds such as friends only livejournal entries which I could access using my lj name and password. I don’t understand why in general this is such a hard feature for RSS. It’s driving me insane trying to find a solution!! Krissa, thanks! Rain, it’s on our to-do. Comzip – our strategy is to create new features, present them to focus groups, and then to redesign them until they’ve been done right. This means that our timeline can be (and has been) somewhat unpredictable, because the number of design iterations required for any particular feature is variable. Getting it right takes some time, especially as the product becomes more complex. Clear design that users can immediately understand without a manual is paramount. We currently expect to be at least another month, and we’ll post another update at about that time. I am looking forward to the new update. Keep it up. Can’t wait till v3 rolls around either. Though you should know that v2 has been a definite staple of mine since it came out – awesome work! Also, with a small amount of user-customization, a Protopage could become a person’s very-easily-updatable public homepage. Just a thought; I love the ease of the double-click to edit, save in the background system! yay! thanks guys – communication is the key to happy customers – especially ones that might be prepared to pay later on down the track! Thanks for the update it’s appreciated. I don’t know if I can hold my breath for a month! Thanks for the effort! I hope the new version supports Safari. Will the calendar become a more interactive piece in the next version? It\’d be great if you could add events to it. Keep up the good work. Scott, we’re looking at extending the calendaring functionality for future versions. Thanks to everyone that has been writing in with specific feature requests, we find these very useful in weighing our design decisions. Looking forward for the next release. But to be honest; this version is already perfect. Great stuff. Thank you ! I love Protopage! While I was editing a sticky note I realized that I couldn’t copy and paste from a note on my computer. Is there a way you can create a control for notes that can access the Windows clipboard? That would be cool. Thanks, Tom. Try CTRL-V to paste into the sticky note (CMD-V on the Mac). a) How do I find out which version of Protopage I’m using? b) Are updated versions automatically applied? D’oh! I’ve been pasting links with Ctrl+V from day one. For some reason I tried right clicking when it came to pasting into a sticky note, saw that Paste was not an option and my brain shutdown. Oh well. While I’m here I have another question/request. I’ve lost information stored online before when companies went out of business. Are there any plans to make our Protopage info exportable so we can back it up locally? It would be nice if if were formatted nicely but even some kind of raw ugly data would be useful just to make sure we don’t lose anything. Thanks for a great service. I depend on it more and more. Quicksilver – I use Protopage as very popular home page for our football forum, easy to update and the new version will make it much better, take a look..
Any more news on the new version?